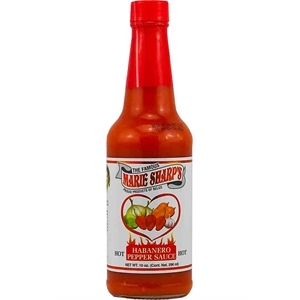 Marie Sharp's Hot Habanero Hot Sauce is the finest product of its kind. This unique carrot-based blend achieves the perfect balance between flavor and heat. My favorite hot sauce. I can't buy it in a store so I have to order it online. Very spicy and very tasty. It goes well with everything—meat or fish (unlike tabasco, which tastes a bit too thin for meat, and sriracha, which tastes way too peppery for fish, for me). I mean "Great" flavorful, with wonderful level of heat. One of the best Habanero hot sauces! I'm literally put hot sauce on everything and after traveling to Belize and trying this stuff we now order it by the case! No other hot sauce touches it!! Simply the best. I've tried other habanero sauces (had to because Marie Sharp's is unavailable locally where I reside), they all fall short of Marie Sharp's flavor and kick. The "Hot" is my personal favorite. I buy the 10oz size. I don't go through them as fast. Try it once and se if you don't agree--there is none better.